China's yuan has just won promotion to the premier league of global currencies. The International Monetary Fund on Monday approved the yuan for inclusion in its elite basket of reserve currencies in what amounts to a major vote of confidence in Beijing's economic reforms. IMF Managing Director Christine Lagarde said the decision represented "an important milestone" in China's integration into the global financial system. "It is also a recognition of the progress that the Chinese authorities have made in the past years in reforming China's monetary and financial systems," she said in a statement. Known as the Special Drawing Rights basket, the group of currencies is used to value assets held by central banks to help countries defend against exchange rate fluctuations. The IMF reviews the basket every five years, and it includes the dollar, euro, British pound and Japanese yen. Inclusion is largely symbolic but it should give the yuan a boost on the world stage, and could give countries more confidence to hold the currency. 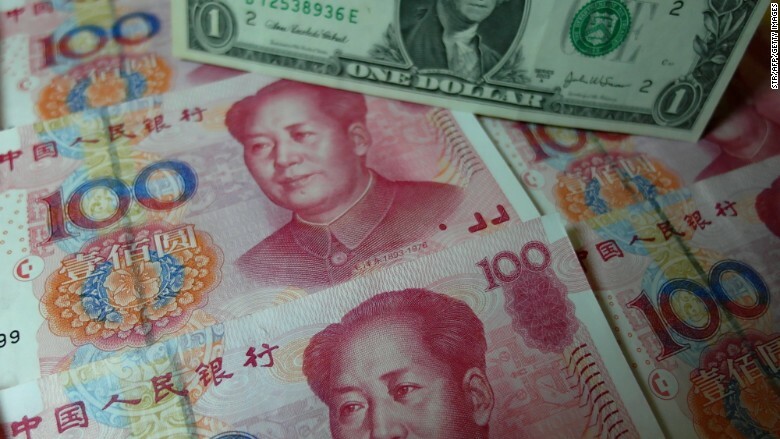 The yuan, also called the renminbi, will take its place alongside the other major world currencies on October 1, 2016. It was trading at about 6.40 to the U.S. dollar on Monday. Premier status for the yuan is a triumph for China, which has campaigned for years to have its currency recognized internationally. In 2010, it failed a previous review to join the IMF's basket because it didn't meet the organization's criteria for currencies to be freely tradeable and convertible. Beijing has historically kept tight control of its currency -- a cheap yuan has helped boost exports and manufacturing -- drawing criticism from the U.S. government for keeping its value artificially low. China's central bank still sets its daily exchange rate, allowing the yuan to fluctuate within a fixed range. But Beijing has begun to loosen its grip -- last year, the central bank doubled the permitted trading range for the yuan. And in August, the People's Bank of China surprised markets by announcing that the midpoint would be based on the previous day's closing price. Related: Why did China crash the yuan? That prompted a devaluation of the yuan, which is down nearly 3% against the dollar this year. Concerns that the yuan may continue to lose value has prompted plenty of people to take money out of China -- around $500 billion as of October. While the IMF has long taken a skeptical view of the yuan, its approach has been shifting recently. Earlier this month, IMF staff recommended that the yuan be included in the SDR basket, determining that it was now "freely usable." While Monday's move is a stamp of approval, Beijing still needs to do more "to open up China's capital accounts and convince global reserve managers to invest meaningfully in Chinese reserve-related assets," wrote Koon How Heng, a foreign exchange analyst at Credit Suisse in a research note.